Stepping off the plane in Dubai marks the arrival into a land of heat, horses and high-rises. While the bustling city itself is no place for the real thing, the Al Qasr hotel at The Madinat in Jumierah gives an indication of just how important the horse is to the United Arab Emirates. The equine fountain at the front of Al Qasr was created by South African sculptor Danie de Jager, as were the above golden arabian horses. The hotel’s sweeping entrance way is lined with 18 larger-than-life bronze arabian horse sculptures, both stallions and mares, and all in dramatic poses. These beautiful golden horses are 1 1/4 life size, and shine like the sun. Photo from AQHA’s Fundamentals of Horsemanship. Tips to keep your horse standing still while you get on. Can you barely swing your leg over your horse’s side before he starts to walk off? If you’re envious of those horses who stand still as a statue until their riders are ready, these instructions are for you. • To get onto your horse without him moving or becoming disturbed. Did you know the horse has the largest eyeball of any land mammal? Did you know his eye magnifies everything he sees 50% larger than our eyes do? Or, that he can see almost 360 degrees around him? Uncertain if alfalfa hay should be part of your horse’s diet? 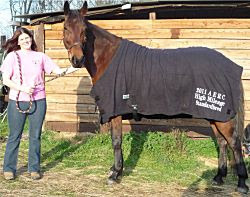 Have a complete diet evaluation by a Kentucky Equine Research (KER) nutrition consultant. When grown, cured, and baled with care, alfalfa (lucerne) hay proves appropriate for many classes of horses. Because of its high energy content and nutrient density, alfalfa is fed extensively around the world. Management situations arise, however, that preclude the use of alfalfa for certain horses. Packing for a trip to go endurance training in Humble, Texas as well as running (on my own two feet, which haven’t been running in four years) a 25km half marathon in Hitchcock requires more than my usual one piece of carry-on luggage. This required a trip to Mountain Equipment Co-op to supplement not only my wardrobe, but luggage with smooth rolling wheels as light as a feather. From reading the previous derby blogs on The Adventurists website, one of the recommended items was a comfortable backpack that would hold a minimum of three liters of water. I picked up the Deuter Trans Alpine 30 with a weight of 1.25kg, which wasn’t the lightest, but was definitely the most comfortable and the tag said it was suitable for “rollercoaster type of rides,” which sounds like a ride on a Mongolian pony. As I was walking by the luggage area, I literally stumbled upon a suitcase with big blue wheels. When I picked it up to move it, I was astonished by how light it was and it was divided up into sections which was perfect for my helmet, riding boots and gloves among other items that really shouldn’t mix with well used riding gear. I highly recommend it and once the company decides to sponsor me, then I’ll let you know the name. (hint hint). Protein is arguably the most misunderstood essential nutrient in the equine diet. Protein is made up of amino acids, and its main function is in muscle, tendon, and ligament development and repair. But, how do protein needs change in the equine athlete? Here are three key points to remember about protein's role in fueling the sport horse. Feeding for recovery after exercise is vital when horses compete in multiday events, especially those that encompass an endurance phase. Such competitions include three-day eventing, combined driving, endurance, and show-jumping events. Nutritionists have identified three key considerations when feeding for recovery: rehydration, replenishment of muscle glycogen stores, and muscle repair and recovery. Rehydration. Horses lose both water and electrolytes when they sweat during and after exercise. This needs to be replaced after exercise to avoid the negative consequences of dehydration on recovery. Though it is hard to estimate the amount of sweat lost in an exercise bout, pre- and post-exercise weight can provide a guide. Plasma sodium levels drive thirst, so supplementation of sodium with other electrolytes is an important strategy at this time. If electrolytes are given in a paste or a stomach tube, the reliance on feed consumption is removed. Irritation of gastric ulcers can occur from electrolyte boluses or concentrated saline drenches. Kentucky Equine Research (KER) developed Restore Paste (available in the U.S. and Australia), an electrolyte supplement that contains gastric antacids and coating agents to minimize the gastric irritation. Mechanical stresses (movements) are critical for the control of tissue form and function. Muscles and bones actively remodel in response to changes in exercise and response to mechanical stresses. This is actually a fundamental feature in all living tissue. Experiments with cultured cells confirm that mechanical stresses can directly alter many cellular processes, including signal transduction, gene expression, growth, differentiation, and survival. In which we meet another Endurance Standardbred: welcome, Eli! I'm writing a series of posts spotlighting some of the fabulous competitors. This is Part 2 of the series. East Meets West, owned and ridden by Patricia Clark. Eli is a 15.3 hand, 2005 model so he is 11 this year. He raced 21 times, won once and earned $7,000 (to non-race fanciers, $7000 isn't a huge amount of money). He is registered with the United States Trotting Association, a son of Western Paradise out of MD Has for those who pay attention to pedigrees. Q. I live in an area that’s selenium deficient. Why is selenium important for my horse’s health, and what is the best way to supplement it in his diet? A. Selenium is a trace mineral, meaning that it is required in the horse’s diet in trace amounts measured in milligrams. Examples of other trace minerals include copper, zinc, iron, manganese, and iodine. In comparison macrominerals—such as calcium, phosphorous, magnesium, sodium and potassium—are needed in gram quantities. Your horse - Shave and a haircut ...should you? Do you prefer your horse clean shaven, and tackle every stray hair with scissors, pulling comb, or clippers? Or are you in the “wild and wooly” camp, whose members sport shaggy beards, hairy fetlocks and whiskery chins? Whichever grooming club you belong to, you may want to reconsider trimming a certain part of your horse’s body the next time the urge to tidy things up overcomes you. Blister beetles belong to a family of plant-feeding insects (Meloidae) that produce cantharidin, a toxic defensive chemical. Contact with it in the blood of live or dead beetles causes blistering of the skin or mucous membranes of sensitive mammals, especially horses. Cantharidin is stable and remains toxic in dead beetles for a long time, so animals can be poisoned by eating crushed beetles in cured hay. In a sport steeped in tradition, Martin Ryan has seen the occasional raised eyebrow at first sight of his new design for a horse’s saddle. Unlike other sports, such as golf or cycling, where new technologies have been embraced, the world of equestrian events has remained largely static, resulting in a saddle that has not changed for centuries, he says. His attempt to bring horseriding into the 21st century comes in the form of the lightweight Bua saddle, a new take on the seat that uses modern materials and production techniques. In effect, it creates two saddles: one that fits the rider, and a second that both better fits the animal and allows it to move more freely.